Mrs. Minor's Kindergarten students and their friends in South Africa are participants in the Kidlink project titled "Draw a Story For Me." Their webpages are in KidSpace for all to see. Each Delmar student told a little about himself or herself in a "web" in Kidspiration software. 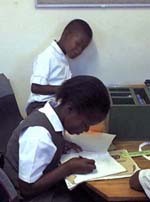 Students at John Wesley School in South Africa posted comments to our Delmar students. 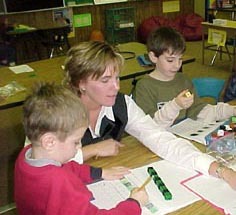 Their computer teacher also sent us pictures of the class. 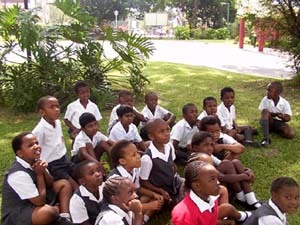 Bethany	-- Hello Bethany I am Tavin and I go to John Wesley School in Pinetown. I am a boy and I am 7 years old. Colin	--Dear Colin My favourite colour is blue. My favourite programme is Dragonball Z. my name is Sachin and I live in Pinetown near Durban in South Africa. I like your drawing. Demyra --	Hello Demyra My name is Dwijesh. I am 8 years old. I like your picture. My favourite colours are blue and purple. My eyes are hazel. My farourite cartoon is Dragonball Z. I live in Pinetown in South Africa. Frank --	Hi Frank, My name is Bheki. I live in South Africa. It is nice to have you for a friend. Julie --	Dear Julie My name is Minenhle N. My hair is black and short and straight and my favourite colours are red and yellow. I am 8 years old. I live in South Africa and I love to have you as a friend. Justin	-- Dear Justin Thank you for your lovely letter. My name is Nonhlanhla and my favourite colour is red. My eyes are brown and my hair is black. I live in South Africa. I loved your picture. Kylie --	Hi Kylie I like you and I want to be your friend. I live in South Africa and my name is Nomawethu. Love is in the air! Ryan	--Dear Ryan My name is Dwijesh. I am 8 years old. I am a boy. I like to eat pizza and burger and chips and cake. I like to play cricket and soccer and golf. I live in Pinetown in South Africa. I like to eat pizza and play with my sister. I like to watch my Batman and Robin video tape but it broke. I like to go shopping with my Mommy at the grocery store and ride bike with my Daddy. My favorite cartoon is Rocket Boy. I have 2 brothers. Nicholas is 1year old and Roland is 6 years old. I like to eat pizza. My favorite food is pizza and my favorite TV show is Sponge Bob. At my house I have a bike that I like to ride. I went roller skating with my Mom and my brother and I had fun. My favorite food is pizza and my favorite sports are football, basketball and soccer. My favorite movie is Pokemon. I like to play with my toy truck that talks. My favorite foods are ravioli and pizza. I like to watch Tom and Jerry on TV. My favorite food is pizza. I like to play my Game Boy. I like to color and pick out pumpkins and apples. I like to eat the apples. I like to go to the zoo. I like to write my name and my alphabet. My favorite movie is Pokemon. My favorite cartoon is Dragonball Z. I like eating pizza. Pizza is my favorite food. I like to watch Dexter's Laboratory and Courage Kelly Dog on TV. I like to play pinball. I'm going to go to the movies and see Clause 2. I like to eat pizza. I like to play with Barbie's and Baby Dolls. My favorite animal is a cat. I have a cat named Cleo. I like to play Tellitubbie games and I like to color. I like to dress up in a dress and play with my friend Cassie. I like to play with makeup. My favorite thing to eat is marshmallows. I think it would be nice to meet you. My favorite movie is Rugrats in Paris. My favorite book is Monkey's Jumping on the Bed. I like to eat steak. I play Barbie's with my sister Shawnee. I have a cat and dog at home. My favorite sport is golf. I like to eat pizza and macaroni and cheese. I would like to have you as a friend. I like to watch Spiderman on DVD. I like playing my Game Cube and computer games. My favorite sports are football and soccer. I like dogs and counting. I like the sky because it is blue. I like peanut butter and jelly sandwiches and I like to take naps. I am 5 years old and I like the color green. I've never met you but I would like to. I like to eat pizza , macaroni and cheese and hot dogs. I like to play with my Barney computer and my Baby Bop toy. I like to play Heigh Ho Cherrio. I have a cat named Jinx and a dog named Rusty. I have a sister named Cassie and a brother named Michael. I like ham and cheese sandwiches and cheese pizza. I like playing with Barbie's and my favorite movie is The Little Mermaid. I love to eat cake, pizza, spaghettios and sandwiches. I like cats and I have 3 cats at my home. I like carving pumpkins. I help my Daddy work on his computer and I go hunting with him. My Daddy and I ride on his four-wheeler.